Today was Seijin No Hi, or Coming of Age Day, which marks the passage of all twenty year olds into official adulthood. On this day, the "new adults" gather in their respective districts for a special ceremony, sometimes bumping into friends they haven't met since elementary school. The young men typically wear a formal black suit. But the young ladies--waaay more fun. In the midst of crowded streets and train platforms, they are small explosions of color and texture, and primped from head to toe: Hair intricately arranged, pinned, and adorned. Makeup expertly applied. The deliberately exposed nape protected by a big puff of fur while outdoors. Body painstakingly wrapped in a shimmering, jeweled-tone kimono with elegant sleeves that pool almost to the ground--the sign of a young, unmarried woman. Feet encased in sleek tabi and zori. From what I can tell, Seijin No Hi seems like just a good excuse--and one of the rare occasions--for young women to dress up in kimono. 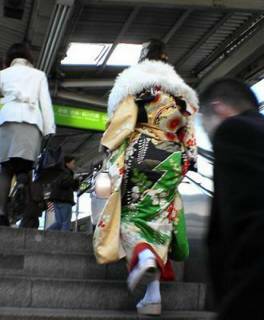 These days, if you see someone wearing a kimono, it is invariably an older woman. The kimono is definitely not easy to wear. I had two experienced ladies helping to dress me in kimono for my wedding, and despite the fact that they were working as fast as possible, it still took them a whole hour. For that reason alone, I can understand why the kimono is losing out to dresses that you can slip on in seconds. It is a pity, though, for the flocks of girls in kimono that I saw today looked absolutely lovely. For more info on Seijin No Hi, this is a good article. Great picture, Rach! I totally forgot what holiday it was, but strangely, I didn't see any girls in kimono yesterday. Yeah, that's a beautiful shot. They really do look so pretty. It's moments like these when I get that itch to have a kimono made. So Lynn, can you dress yourself up like that?? Not myself, but I can dress someone else like that. Since I'm married, there will never be an occasion for me to dress up like that. Married women are supposed to dress more conservatively, sigh. Thanks, girls! It was pure luck that the picture wasn't a big blur. Everyone was rushing to catch the train, and I grabbed my cell phone and sort of chased this girl up the stairs. Lynn, I'd really love to see more pictures on your blog of your kimono class! You know what they say, luck is being prepared when the opportunity comes (or something like that). Anyway, well done! And I will try harder in the future to include kimono pictures, but the obi and kimono we practice with are no where nearly as gorgeous. What a beautiful tradition. Thank you for sharing it with us not-in-Japan folks. Coming of age ceremonies and traditions always interest me, because they are so colorful and so different in each culture. So are the responsibilities that come with adulthood, and the age of onset, for that matter. I think we in the US miss out on that ritual a bit. Getting your driver's license or voting for the first time really can't compare, and the weight of tradition is simply missing. Even high school graduation is not this beautiful! What about Germany, Jessica? Do the kids celebrate somehow when they officially become adults? That`s a really good shot by the way.